Houghton Mifflin Harcourt, 9780544336650, 128pp. 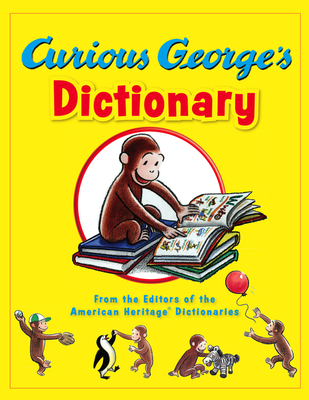 Curious George brings his curiosity to the world of words in this lively picture dictionary for young children, now available in an updated version. Curious George's Dictionary is designed for children from preschool through kindergarten. It is both engaging and educationally sound, featuring imaginative illustrations of Curious George and his friends along with a vocabulary list that reflects recent research in early-childhood education. The main part of the dictionary is an A-Z section containing approximately 600 words, six words to a page. Each word is illustrated with a full-color drawing, most of which have been drawn specially for this book by illustrator Mary O'Keefe Young. Over half of the illustrations include a sample sentence that puts the word in a familiar context. A whimsical four-page illustrated story at the front of the book shows George learning how to look up words in his dictionary, drawing children in while introducing them to dictionary skills. At the end of the book, eight full-page features present groups of thematically related words such as colors, shapes, and numbers. THE EDITORS OF THE AMERICAN HERITAGE DICTIONARIES are a team of professional lexicographers with advanced degrees in various scholarly fields. The editors familiarize themselves with the vocabulary in specific subject areas, collect materials on new developments and usage, and work with expert consultants to ensure that their publications are accurate and up-to-date.